Home > Optimization Performance	> SET STATISTICS IO – What is Scan count? SET STATISTICS IO – What is Scan count? SET STATISTICS IO is a typical command which lets Database users to display information regarding the amount of disk activity generated by the Transact-SQL statements. This command can be set to either ON or OFF. Switching it to “ON”, it displays the stats of activity done by the SQL Server engine, like Scan Counts and number of Page Reads (Logical/Physical). Number of seeks/scans started after reaching the leaf level in any direction to retrieve all the values to construct the final dataset for the output. – Scan count is 0 if the index used is a unique index or clustered index on a primary key and you are seeking for only one value. For example WHERE Primary_Key_Column = . – Scant count is 1 when you are searching for one value using a non-unique clustered index which is defined on a non-primary key column. This is done to check for duplicate values for the key value that you are searching for. 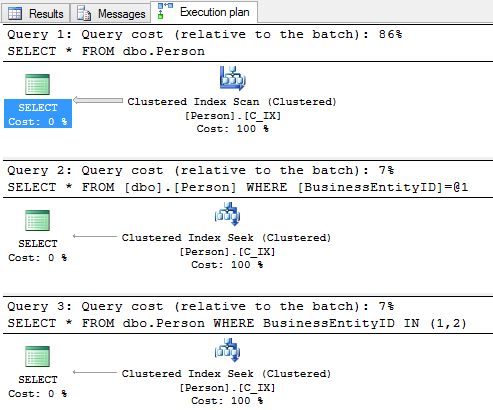 For example WHERE Clustered_Index_Key_Column = . – Scan count is N when N is the number of different seek/scan started towards the left or right side at the leaf level after locating a key value using the index key. In the above Output window we can see that Scan Count = 1 in all the three queries. This is because the table does not have an index and it does a single full Table-Scan for every query above. 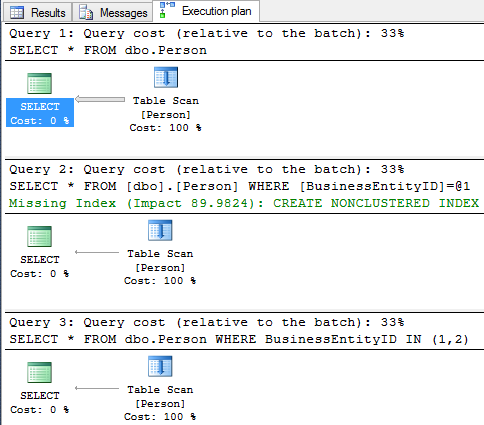 The Execution plan below shows that all 3 queries are doing full Table-Scan. In the above Output window we can see a difference in Scan Count in all 3 queries. 1. First Query shows Scan Count = 1 as there is a Index but to return all rows it has to Scan the whole Index. 2. Second Query shows Scan Count = 0 as it uses the Index, but does a Index-Seek instead of Scan and Optimizer knows that there is only 1 value for BusinessEntityID = 1. 3. Third Query shows Scan Count = 2 as it also uses the Index, but it does a ORDERED FORWARD seek as it is looking for 2 different values, i.e. BusinessEntityID = 1 and 2. Note: You will also see a reduction in number of Reads for the 2nd & 3rd queries, as it is utilizing the Index we created on the table, thus optimizing the performance. Here, we can see the Scan Count = 5 for the above query and reason is obvious. It is doing 5 ORDERED FORWARD Seeks to retrieve the 5 unique values.